another article hits the jungle. Really, another one? 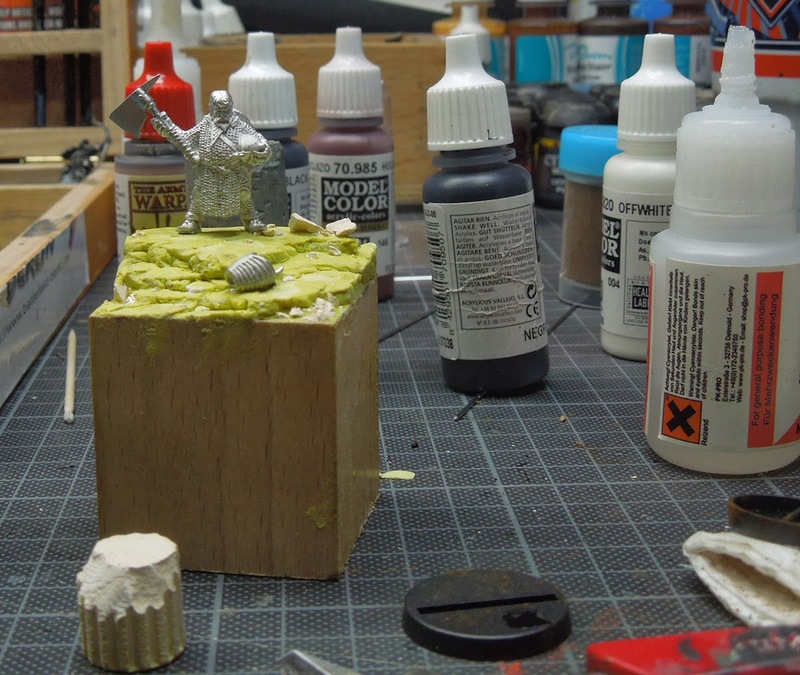 MV's year of the painter brings you excellent hobby tips, tricks and inspiration. This article will not be different. Well, this article is about basing again. 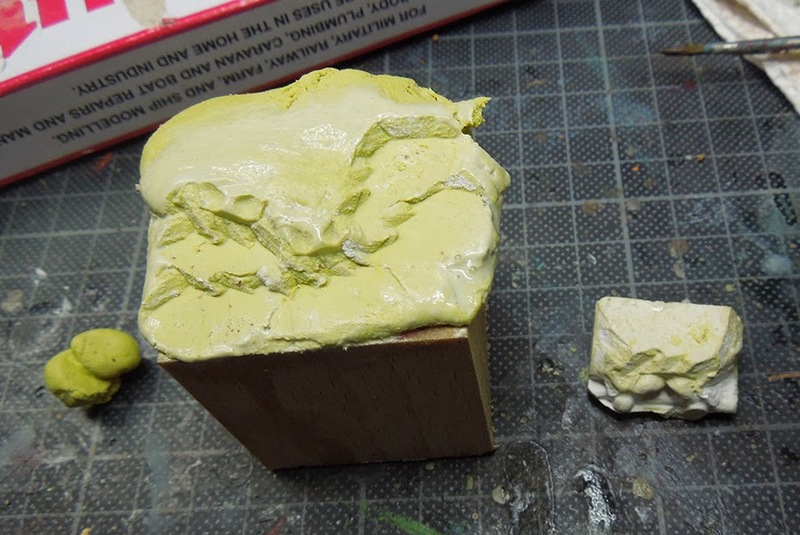 I will show you a funny and enjoyable way on how you can create different textures on Milliput, Standard Yellow. 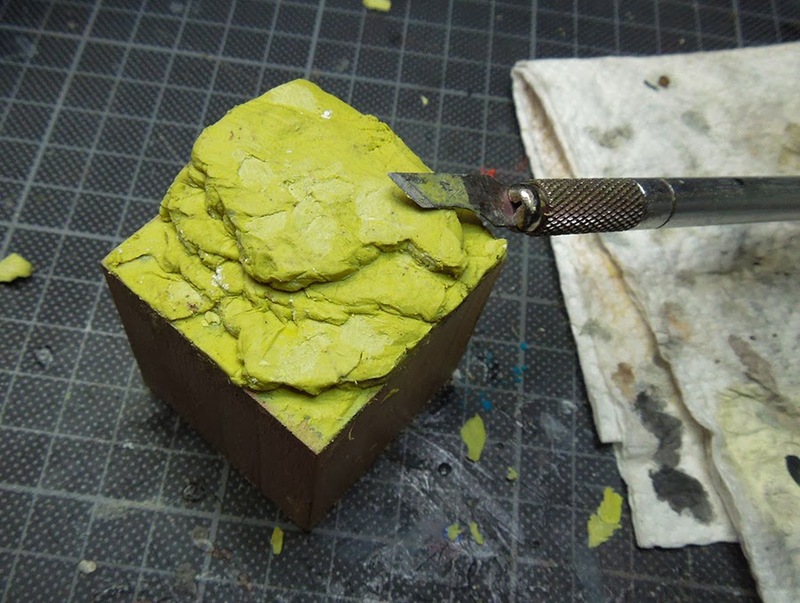 You can also use different clay here, for basing I prefer using Milliput, which is just my personal taste. This technique is really simple and can lead to great results. 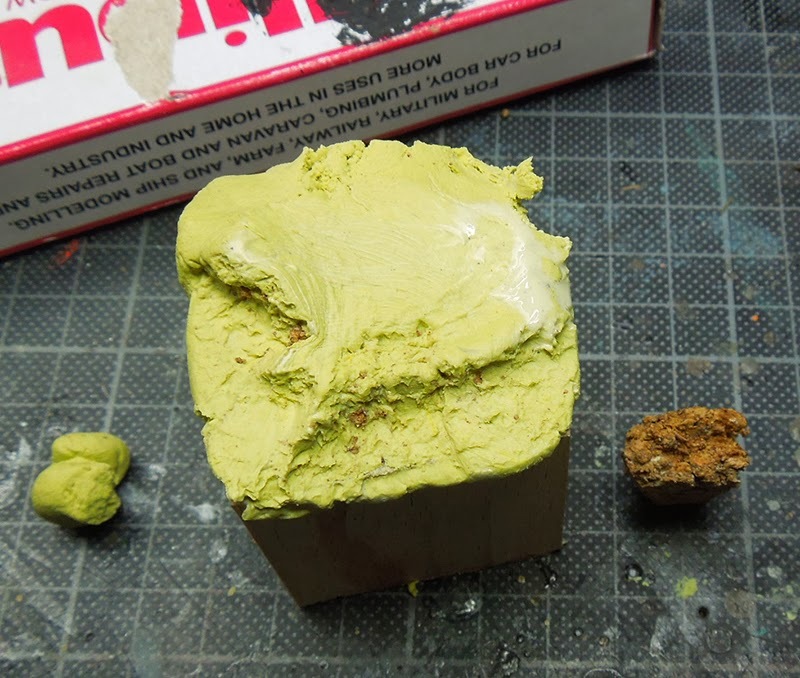 Just mix your two component Milliput Standard Yellow 50/50 and take your time for that. 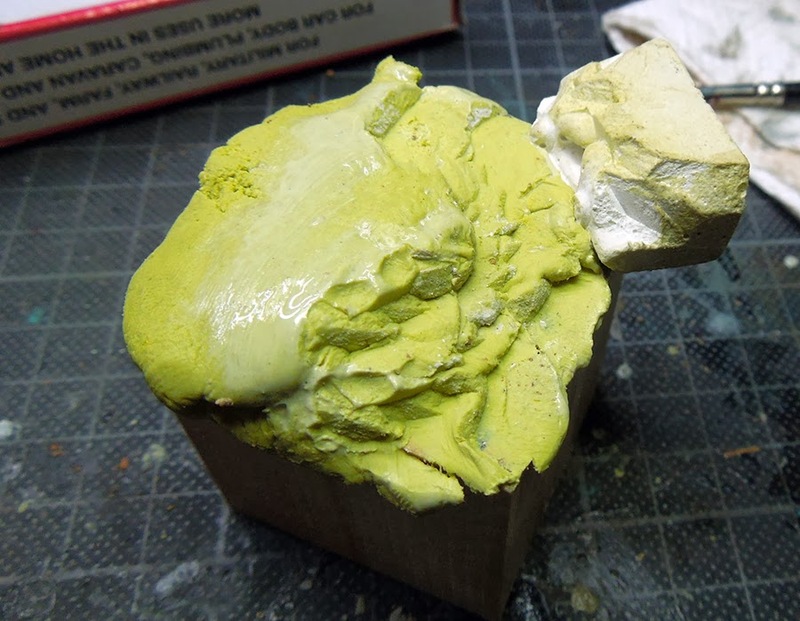 It should really be mixed well or it will not dry hard as a rock. When it is mixed you have around two hours of working with it from now on. The first hour the Milliput will be more soft, in the second hour it will get hard slowly (Good to know!). After those two hours it is really hardening quick, but still you can do something with it. 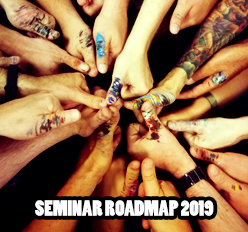 Soon more about the different stages. 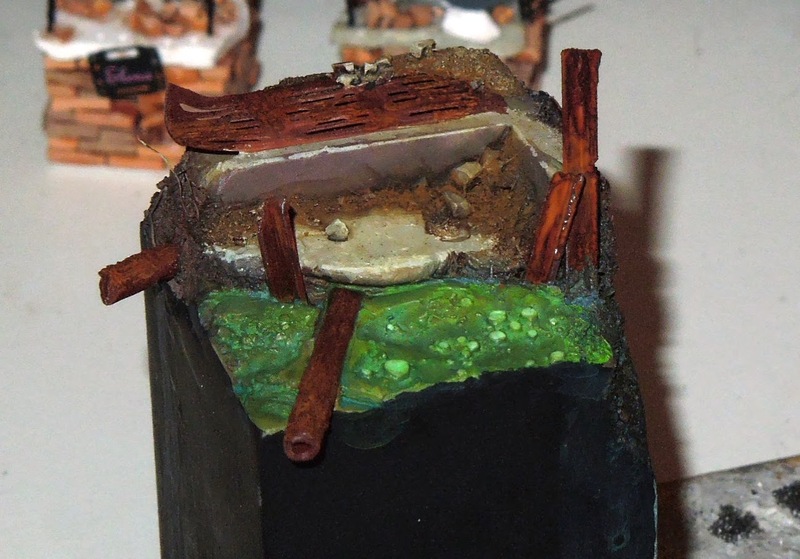 I place the mixed Milliput to a wooden plinth (you can also do that to a gaming base). 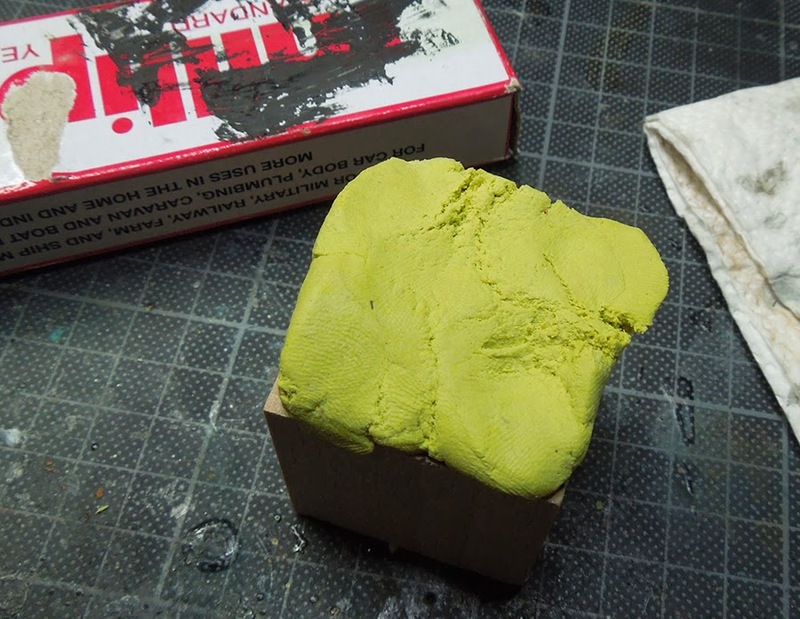 You can see on the example below how my fingers already made a funny texture to it while pressing it in shape. I could already leave it like that, but that is too simple I say. If you don't like the texture it produces just wet your fingers with water and make it plain again to make the surface ready for another stamp test. Next one was done during a painting class. It was done by the help of a stone who got holes in it, like this one here! The stone was stamped into the Milliput to achieve the look of bubbles in lava or slimy water. Next one is a piece of plaster from Hirst-Art and we will spent some more time with that one. It is already a little damaged but I don't care about that, just makes my stamp more interesting I hope. Free your mind for such tests to find what you like and don't like. Open up and do experiments. 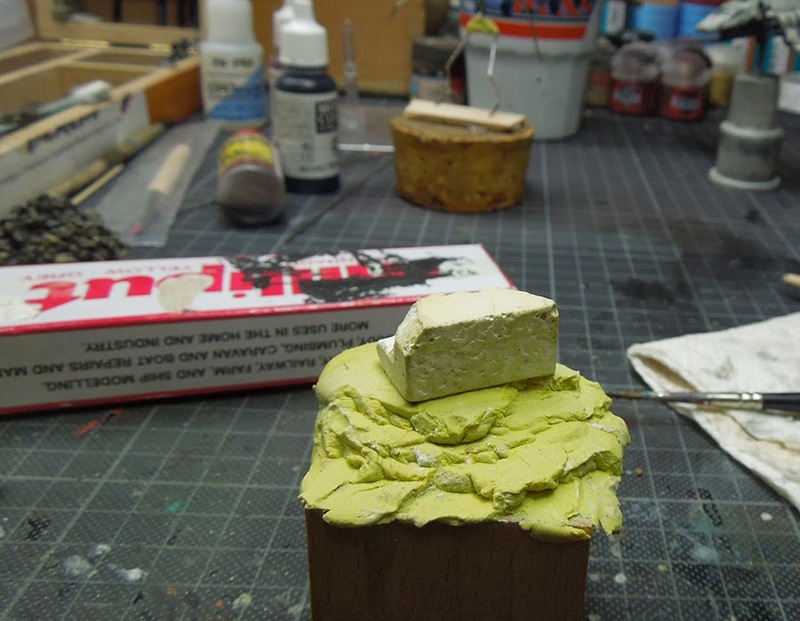 I used mainly the side of the plaster piece as I like the structure there the most. 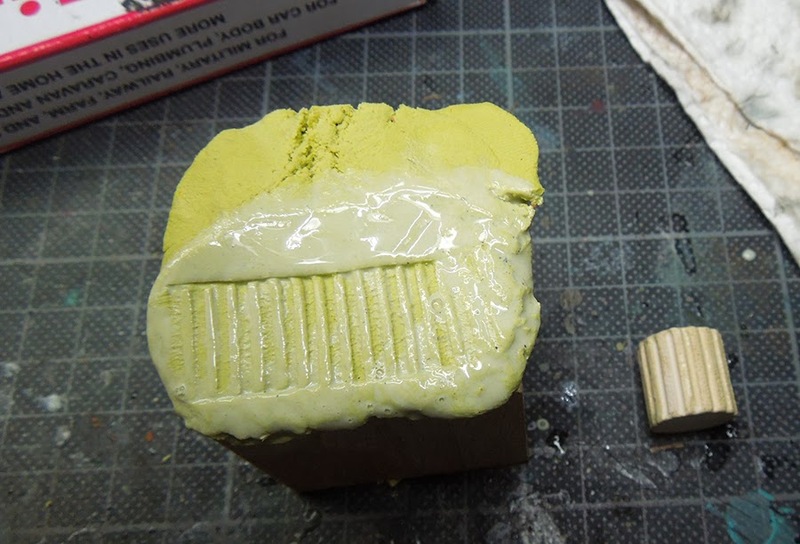 Now I press from the side into the Milluput to stamp it there and bring the whole base in the shape that I like. 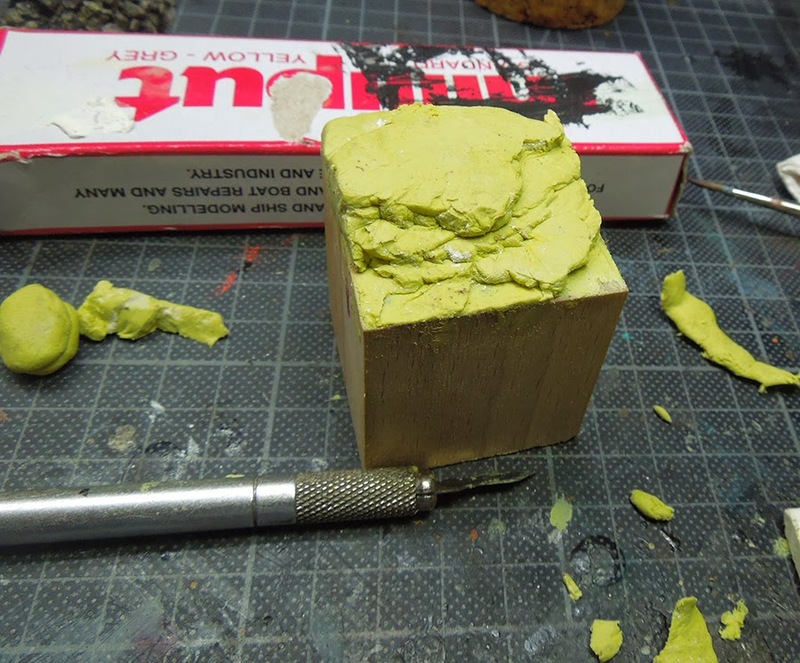 I use its flat bottow to bring bigger surfaces to a plain area. All done with that one piece of plaster, but I hope you know that you can do this with tons of other "stamps" that you collect. It does not have to be the same plaster piece I am using here. Keep your eyes open, find your own ideas, follow your inspiration and stamp like you never did before to gain your own experience. After two hours the Milliput really gets hard. Now is the time to cut some detail stones with the scalpell and bring in more detail to the base overall. Chop! Chop! 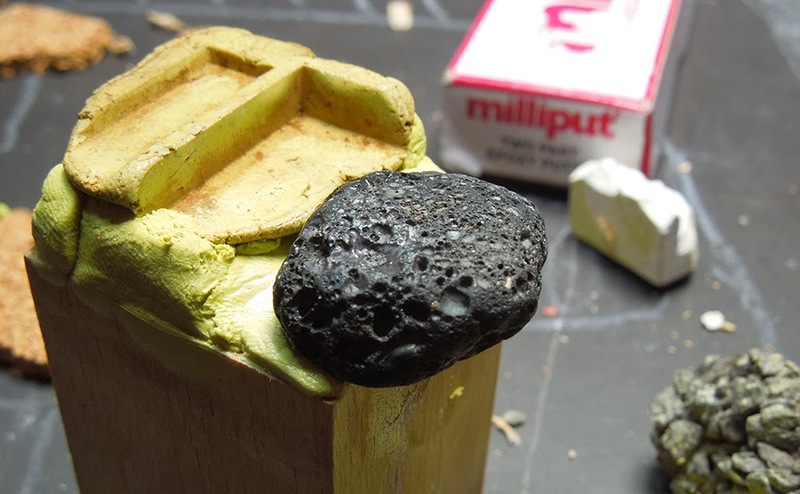 Even the Milliput is not completly dry yet in this stage I can already prepare some additional materials. 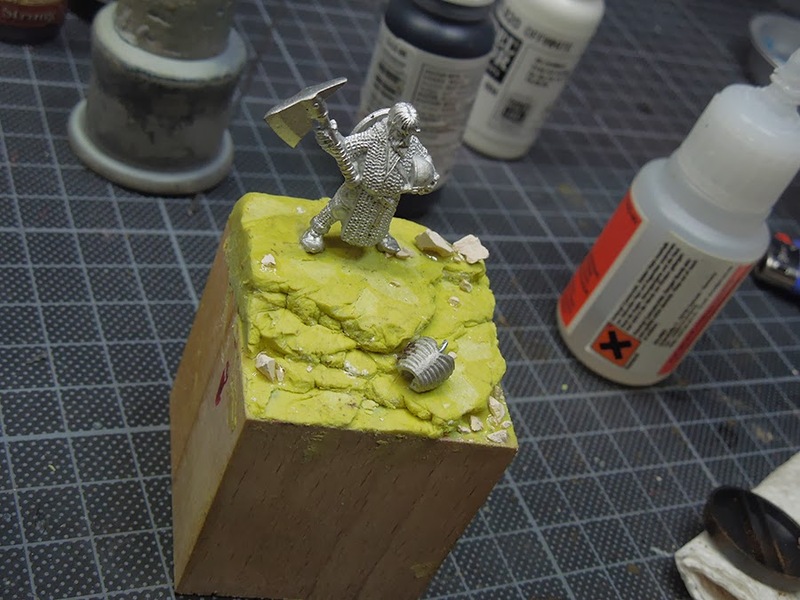 I used some small plaster pieces for debris and a skeleton torso and placed a Hasslefree Dwarf Warrior on top of that quick base. When the whole Milliput is completly hard (next day) I work my time at the the still unclean edges of the plinth with using sandpaper to make them smooth. Easy procedure and that's it. Ready for priming. Read you soon and keep on happy painting! Continue this great work, since my experience in your painting class I am a daily visitor of MV! Great! I already used this method (lerned while on my first Massive Voodoo Beginners class) but it is always good to refresh the procedure. Especially the length of the stages was not so present. Great tutorial Roman! Here is a little trick I use - Take a piece of balsa wood (1/2" thick X 1" X however long) snap it in a few pieces. I find that the broken ends make great little tools for working the epoxy putty. The way the wood breaks gives you random rough shapes that make nice surface texture resembling stone, earth, etc. if I use DAS could I get the same results as well .